COMPASS is dedicated to serving postdoc and graduate student needs both throughout the year and at the ASCB annual meeting. As mentioned in last week’s blog post by COMPASS co-chair Bruno da Rocha-Azevedo, our COMPASS survey revealed that a major concern for postdocs and graduate students is planning for the future and uncertainty in funding and the job market. With this in mind, the committee has been busy planning and organizing events at the annual meeting to help ameliorate some of that anxiety. Whether you’re looking for great science from your peers, career development opportunities, or a chance to network, COMPASS has an exciting lineup of events catering to all. Here we want to highlight some of the fantastic programming COMPASS has organized, but be sure to download the app (search for ASCB2016), online mobile app, or check out the online program for a full list of programming at the annual meeting. This year, we are fortunate to have a presentation and workshop focusing on stress management techniques by Nichole Proffitt, a Mindfulness and Mindfulness-Based Stress Reduction Instructor from the UCSF Osher Center for Integrative Medicine. This session will aim to introduce mindfulness practices for supporting stress reduction, general health, and well-being. These practices aim to help support students and postdocs in navigating the uncertainty of their professional future, plus provide useful information about the neuroscience and physiological impacts of mindfulness. The COMPASS career subcommittee has organized numerous career panels throughout the annual meeting directed at various career paths. Topics include: Industry, Applying for the NIH K99, Science Policy, Teaching and Administration, Navigating the Faculty Job Search, Entrepreneurship and Consulting, and Science Communication. This is an interactive opportunity to hear panelists share their perspectives and expertise, and to ask questions. No matter what you want to do in the future, one thing is certain: networking is important. 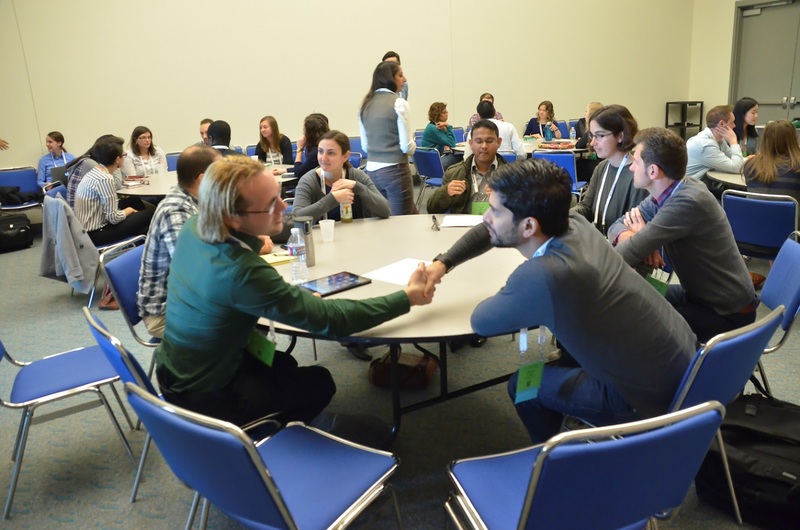 Stop by the networking happy hour, an opportunity to meet with select ASCB exhibitors, career panelists, and other ASCB members in an informal setting at the Career Center. Whether you want to establish new contacts, are searching for a job, or simply want to learn more about the vendors, we encourage you to drop by and mingle. If mingling is hard for you, do not fret! We will be playing networking BINGO, with prizes for winners. Cash bar will be available and light snacks will be served. The Microsymposia (formerly known as e-posters) are taking on a new format this year with short, 5-minute talks from 9 speakers per session with time for Q&A. COMPASS has organized 18 sessions ranging from cytoskeleton and cell motility to trafficking to cell development and disease, and more. This is a fantastic opportunity to learn science and gain exposure to great research in a short amount of time! Join Future of Research executive director and COMPASS member Gary McDowell along with COMPASS communications subcommittee co-chair and FoR volunteer Adriana Bankston to discuss ways to efficiently and effectively pursue your career development goals. The session will discuss what kind of resources we currently use, and what resources we need or may want, for both raising career awareness and seeking development toward various career tracks. The interactive session will involve brainstorming about what career resources junior scientists feel are working, are not working, or are simply not available, and the group will share ideas and constructive solutions about how to decide upon and follow career goals. COMPASS is also hosting numerous additional events in the Career Center: Career talks ranging in topics from effective science communication skills to preparing for a faculty career, CV review by ASCB members, and career advice from career coaches. Be sure to stop by throughout the meeting for any career-related activities! While there may be a lot of uncertainty in the future, COMPASS is dedicated to promoting the active participation of students and postdocs in the scientific community and maximizing their professional effectiveness. We encourage all of you to participate in our many career development sessions and events planned for the annual meeting, and be sure to share your opinions through social media with #ASCB16.